New to the artist's circle this year, renowned doll creator Mel Odom makes his debut with a Cissy entitled "Cocktails". 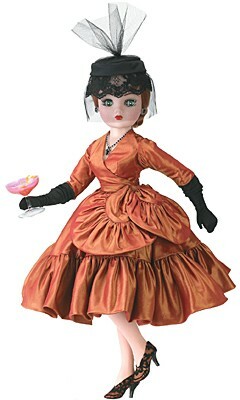 Dressed in a iridescent copper taffeta dress with fuchsia undertones, 21" Cissy wears her coppery red hair coiled into a chignon and tied with a black velvet bow. The dress features a wide ruffled hem, and an interesting sash treatment at the waist. A fuchsia tulle petticoat, a black satin, lace and tulle hat, black lace and satin shoes, long black gloves and a necklace complete her ensemble. All that's needed is the "Cocktails", and for this Cissy arrives at your door carrying her own martini glass.Limited Edition of 200. Retired item - available for limited time.